State Parks located in North Georgia! Windows to the past can be found all across Northwest Georgia in the Historic High Country region, where the Blue Ridge Ridge mountains begin their ascent. As a major settlement for Native Americans, a plethora of historical sites and beautiful State Parks are scattered across the rolling hills and rippling waterways of the our area. Situated in the middle of the Chattahoochee National Forest and Cohutta Wildlife Management Area, Fort Mountain State Park is 5 minutes from Wilderness View Cabins and The Overlook Inn and Lake Conasauga and Carters Lake are a hop and skip away. Once you've explored Fort Mountain, you can pack up a picnic and drive 30 to 40 minutes to Amicalola Falls State Park, Etowah Indian Mounds, Cloudland Canyon State Park, or New Echota State Historic Park. Tallulah Gorge State Park, Unicoi State Park, and Vogel State Park are approximately an hour's drive from our property. Buy one pass and visit 8 State Parks - what a wonderful way to spend a family vacation! 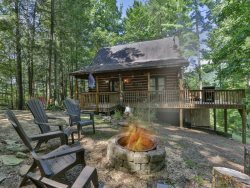 Just 5 minutes from Wilderness View Cabins, Fort Mountain State Park rests on two mountain peaks near the summit of the most prominent peak of the Cohutta Mountain Range at the terminus of the Blue Ridge Mountains. The elevation is just approximately 3000 feet. The park derives its name from an ancient 855-foot-long rock wall, steeped in mystery and legend, that stands on the highest point of the mountain. Situated in the Chattahoochee National Forest, the 3,520-acre park has overlooks showcasing stunning views, 14 miles of hiking trails, and 30 miles of mountain biking trails. One of Georgia`s best kept secrets, the park also contains a lake with a swimming beach, picnic area, and canoe rentals and miniature golf. An ancient stonewall whose prehistoric origin remains steeped in mystery and legend is located within the boundaries of the State Park. Great fun for kids and adults alike with nature programs and scheduled outdoor adventure race events. Amicalola Falls State Park is an 829 acre park highlighted by the tallest cascading waterfall in the Southeast. Amicalola is a Cherokee word meaning "tumbling waters". The falls, formed by Little Amicalola Creek, plunge 729 feet in several cascades, which makes it the highest waterfall east of the Mississippi River. Activities include ranger programs, hiking, waterfall photography, picnicking, fishing, and geocaching.